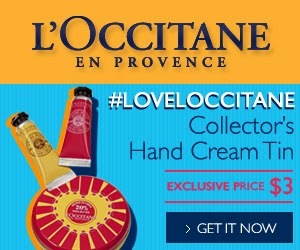 Get L'Occitane's gorgeous Collector’s Hand Cream Tin for $3.00 while they last! Order here online, or click here to find your closest boutique! Sharing Shea Butter is a gift of love. Made with 25% Shea Butter from Burkina Faso, West Africa through economic fair trade partnership. *Limit 1 per customer for a limited time only! Overall Assessment: Get yours while they last! These are perfect for travel or for your purse! I remember that you scored when I first posted that they were giving some away! I love the size as well, and they are perfect for travel or carrying in your purse. I love their hand creams as well. I absolutely love the TATCHA Indigo hand cream as well! The WHole Indigo line is amazing! That's amazing that you were able to refill the travel size– that's a definite bonus, indeed! I had inquired with Tatcha regarding refilling the travel-sized enzyme powder when I purchased it. (I did not want to ruin the container by testing it myself.) The response was that all of their travel-sized containers are made to be refilled. Thus I made my attempt to pry off the tip of the travel-sized hand cream container when it got low. Very easy to refill. It gives Tatcha another 'point' in my book: They are being both eco-conscious and wallet-friendly by not requiring subsequent purchases of the travel sizes. I agree that the entire Indigo line is fantastic. If you recall, I gifted the soothing renewal treatment to my SIL when I visited. She has rosacea and it is working great on her face. That is very pragmatic and eco friendly, indeed! I remember that you bought it for your SIL, and am thrilled to hear that it has worked so well for her rosacea! That certainly turned out to be a life-changing gift if it gave her relief! Yes and one I could repeat many times as that is something she would never purchase for herself due to the price. Then that makes it an even more meaningful gift!